The temple has a navaranga mandapam which surrounds the sanctum sanctorum. The principal deity is Sri Ranganatha in the sleeping posture with the Adi Shesha, the serpent with seven heads. 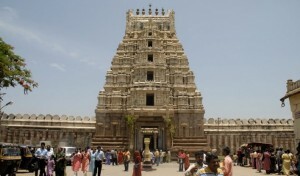 The Sri Ranganatha Temple is in a small island on the river Kaveri, in Mandya District. This temple is dedicated to Lord Vishnu and has an idol of the Lord in his reclining form, called Ranganatha.